Halloween display at Fort Campbell taken down after complaints. Contributed photo from clarksvillenow.com. Lynching is no joking matter in the United States. 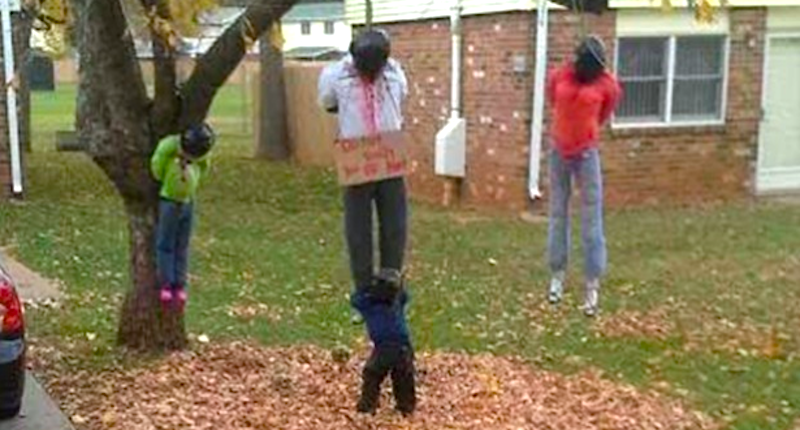 News manager Robert Selkow found himself in the middle of a controversy over a Halloween display featuring three figures hanging from a tree. Selkow contacted Ethics AdviceLine for Journalists in facing this sensitive issue, and agreed to discuss details of the case publicly. The offensive Halloween display was in the residential area of the Fort Campbell military base on the Kentucky-Tennessee border near Clarksville.